Get yer Kling Klangs out. 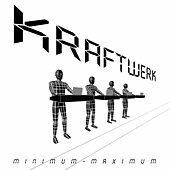 After 35 years of crisp Teutonic electronic perfection, Kraftwerk finally release a proper double live album. Recorded worldwide during their 2004 tour, it features all the classics without which dance music -- and much else worth listening to -- would not exist. Operators who missed this will listen and weep into their pocket calculators.